This solution is perfect for anyone that wishes to focus on their photography with no distractions and without wasting time! With the new "Full Service Design” service, we offer photographers the chance to have Albums or Event Books laid out by expert Graphic Designers with many options to chose from to match your style. It saves you time. Laying out an album can take a lot of time that takes you away from what you love! 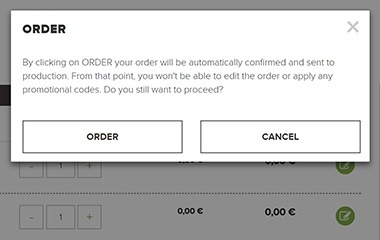 You can directly edit the layout online with your customers to speed up correction times and order confirmations. 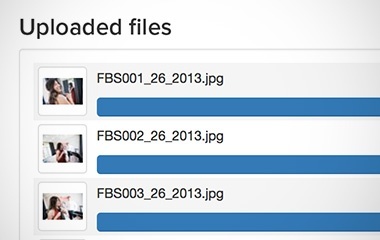 Select or drag the photos of your event from the relative folder on your PC. 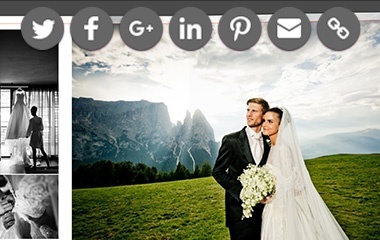 When uploading is complete, start the page layout. Your product will therefore be in the basket but cannot be edited yet. 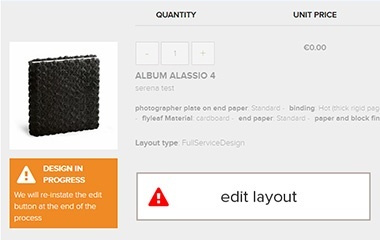 Within 2 working days you will receive an email telling you the layout is ready and you can edit it online with AE Veloce.The link to the project will be in the basket under the item "edit page layout”. You can view the page layout, edit it and share it online with your customer so they can approve it or request changes quickly. If your customer requests changes, you can make them yourself.